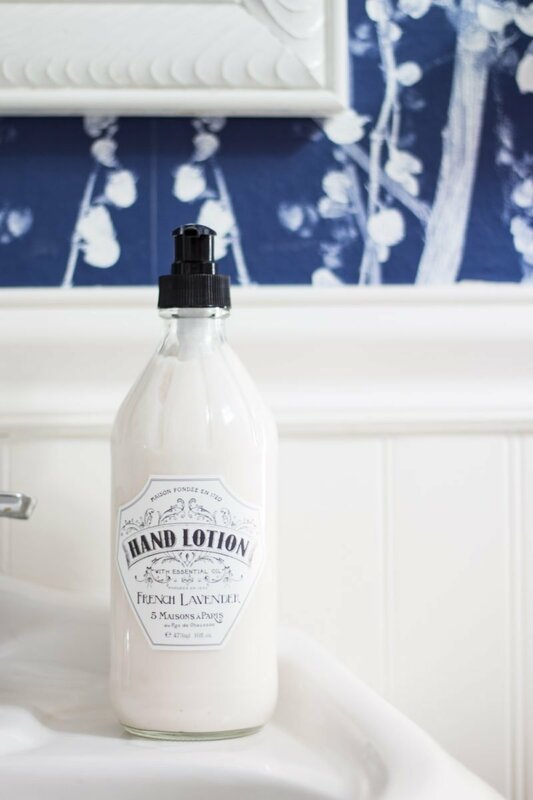 I am beyond excited to show you our downstairs powder bathroom reveal today. We have slowly been working on this space for the last four months. I took my time pulling it all together and thanks to the artwork, it’s now complete. While most of our home is neutral, we aren’t afraid of color. 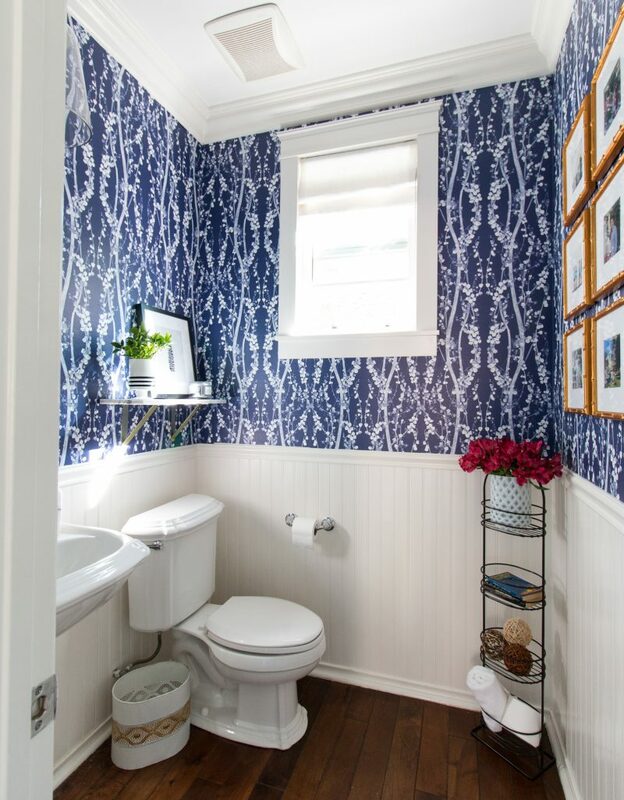 I’ve used a splash of blue and white throughout our downstairs and this bathroom was the perfect spot to go bold with saturated color. Here it is! Welcome! In all honesty, I wish you could just pop over and see it for yourself. Bathrooms are beyond difficult to shoot and it reads very warm and welcoming in person. The wall to the right is a series of nine frames thanks to Framebridge. I was able to select Instragram photos that are special to our family and they framed them beautifully. It’s important to give credit where credit is due. I receive a good amount of things shipped through the mail because I purchase online. No company comes close to their packaging and ease of opening and hanging. Truly top-notch. Kudos, Framebridge. My husband and I were saying that this might be our new favorite gift to give. There’s a discount code at the bottom of this post for you in case you want to give it a try. We went super bold with this temporary wallpaper by Tempaper. Sort of obsessed with it and the amount of color and energy it provides in this little bathroom. The wallpaper is self-adhesive and can be removed. Genius! I think most people tackle focal walls so jumping into a four walled bathroom was a bit daring but I would do it again. While the gallery wall adds gold to the space, I wanted the rest of the bathroom to be blue and white with a touch of black. The marble shelf adds a bit of glam and is a great space to style. These ceilings are 10′ high which can be very tricky. The mirror is quite tall and I didn’t want to have to fill the entire space to the right so the visually heavy shelf adds enough weight to that side of the wall. It was difficult to capture a great shot of the pendant, but that was a lucky HomeGoods find. My husband cased out the window which made a huge difference. Really just so much more substantial and custom now. 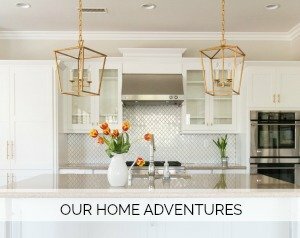 We chose a craftsman style casing to go with the rest of the home. The roman shade is from Barn & Willow. The same company that made the roman shades for our breakfast nook. There is obviously a lot going on with the blue wallpaper so the gallery wall breaks it up just enough. The combination of the gold bamboo on the blue paper makes me so happy. 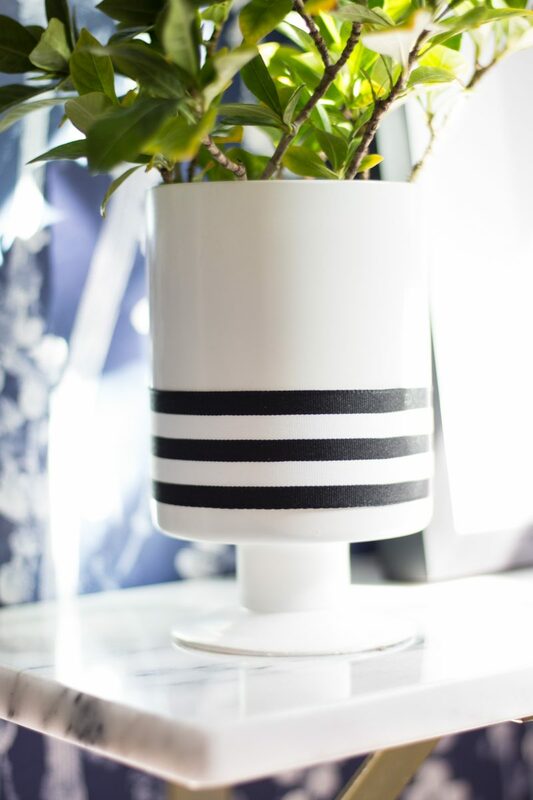 Not sure if you remember, but this little vase was a DIY project I did a while back. 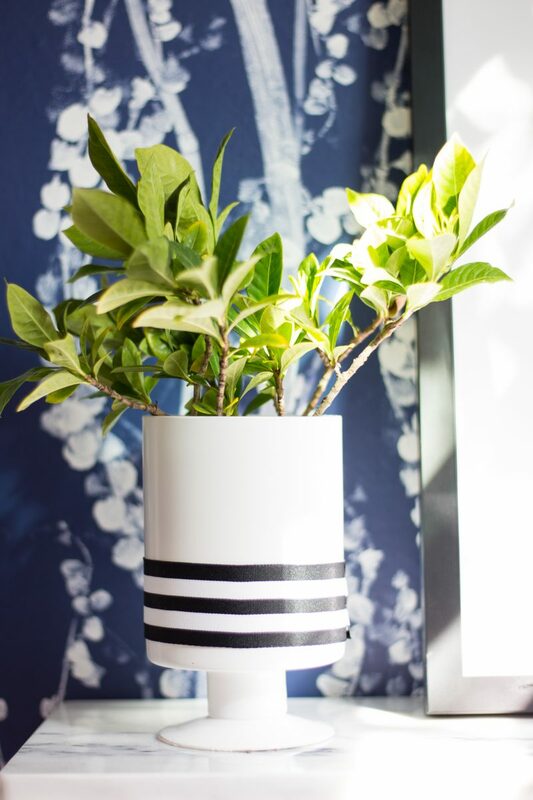 So easy and a fun way to add fresh greens cut from the yard and a little bit of black and white. I downloaded this leaf print and then had Framebridge frame it. It turned out really well and I love it on this shelf. 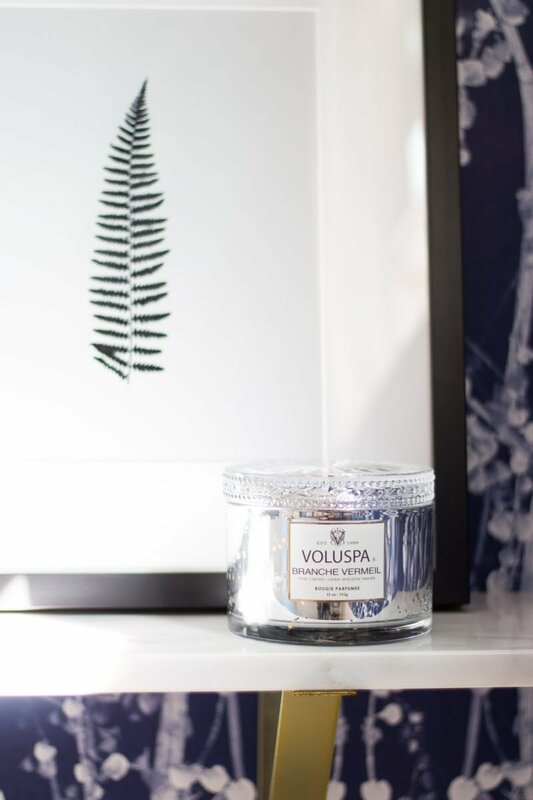 This candle was given to us as a house-warming gift from my sweet friend Elizabeth over at Pretty Smitten. My towel bar secret for smaller spaces is using a toilet paper holder. Yep! 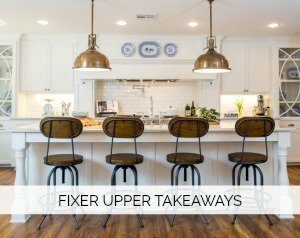 Works like a charm and I prefer the look to the towel rings which take up more visual space. I will confess that this white towel will only come out when we entertain. I have a blue one for daily use as my kiddos are in and out of here nonstop washing their hands after playing outside. There is no hope for keeping a white hand towel white on a daily basis. Here is a look at the before and after. We had so much that was already pretty. We really just added the color and pattern through wallpaper and artwork. Don’t be afraid to step out of your comfort zone when it’s such a small space. Thank you for letting me share! It’s been a really fun bathroom to design. Watch for an upcoming post where I share tips and tricks for hanging the self-adhesive wallpaper. Have a great day. All sources are listed below. Stunning makeover! The gallery wall is amazing. Love those frames! Using a toilet paper holder instead of a towel ring is genius! 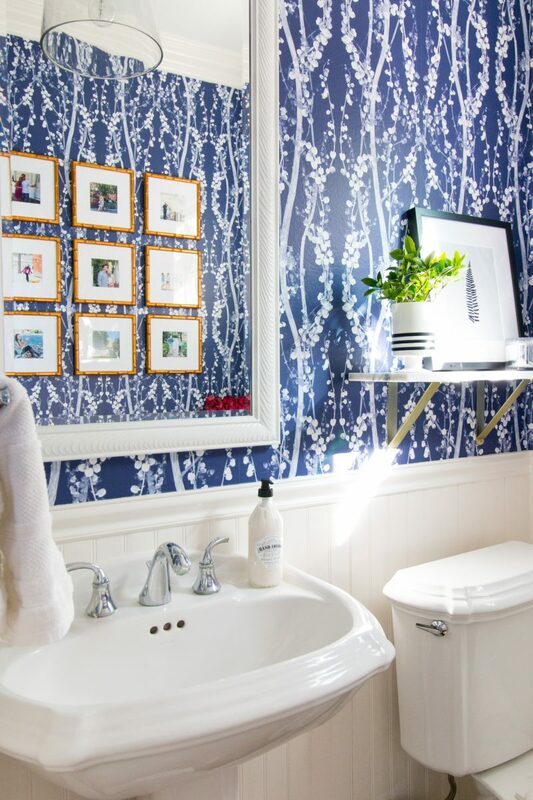 Love the wallpaper, and what a super genius trick with the toilet paper holder as towel bar–I will be trying that!! That gallery wall with those gold bamboo frames…???? Beautiful space! ???????? Thank you so much, Megan. That is so nice of you to say. It’s been fun to work on. Have a wonderful day. You made my morning. So sweet. Thank you, Jen! Such a kind compliment. I am trying to gather all of my tips for the wallpaper. Overall, it was very easy to do. I just love the idea of it being removable. Makes the commitment so much easier, right?! Have a great day. Absolutely love the wallpaper and the way it makes the gallery wall pop! Awesome job! Thank you, sweet girl. Loved seeing the birthday photos. How is time going by so quickly. Make it stop. Love you. Have a great day, friend. Beautiful bathroom! 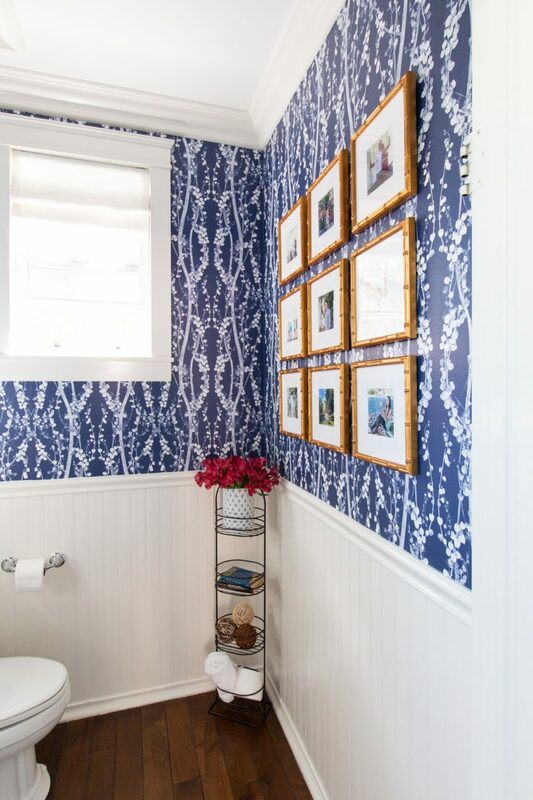 The blue wallpaper with the gold frames is a very striking combination. The gallery wall is so pretty. I love having special photos framed around the house. Beautiful job Courtney and Ryan! Love the idea to use a toilet paper holder for a towel! Gorgeous bathroom!! Fabulous job! It looks absolutely gorgeous! Love how you thought of every detail. How long did it take you to do the wallpaper? Was it difficult? What a dramatic makeover, color makes all the difference! 🙂 Great job, Courtney! You did it again! Love the wall paper and frames!! Will be using the toilet holder idea , wonderful! The rings are always bulky and seem to not wear well. Bravo and enjoy your new space! The toilet paper holder idea is genius! Thanks for sharing. Any chance you might offer a tutorial on framing out the window? Beautiful job, Courtney! I love the combo of gold bamboo and blue, and the whole space just looks so happy and fresh. 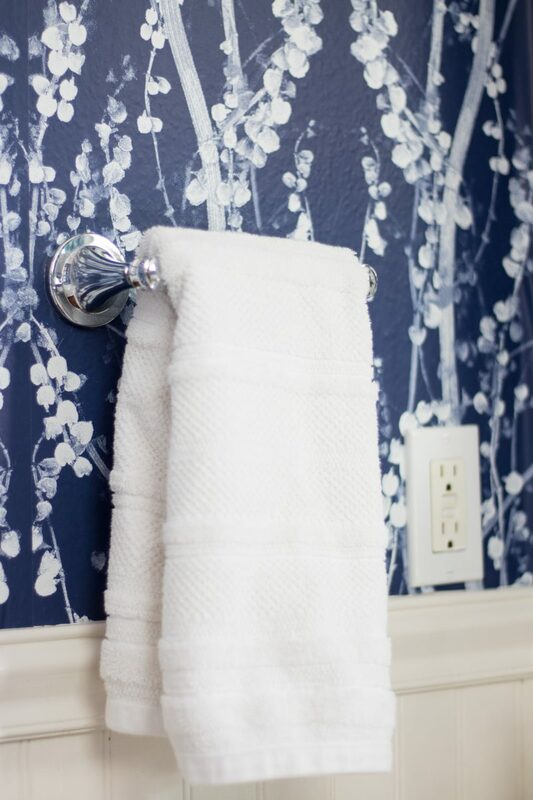 And I giggled about your white towel–my kids destroy mine, too, so I’ve started picking up cute (but cheap) dishtowels from HomeGoods and the Target Dollar Spot to use in our powder bath! Very nice! I love the wallpaper with the gold bamboo frames too! Really makes both pop. Gorgeous! I love the wallpaper! Wonderful job! The bathroom is stunning. 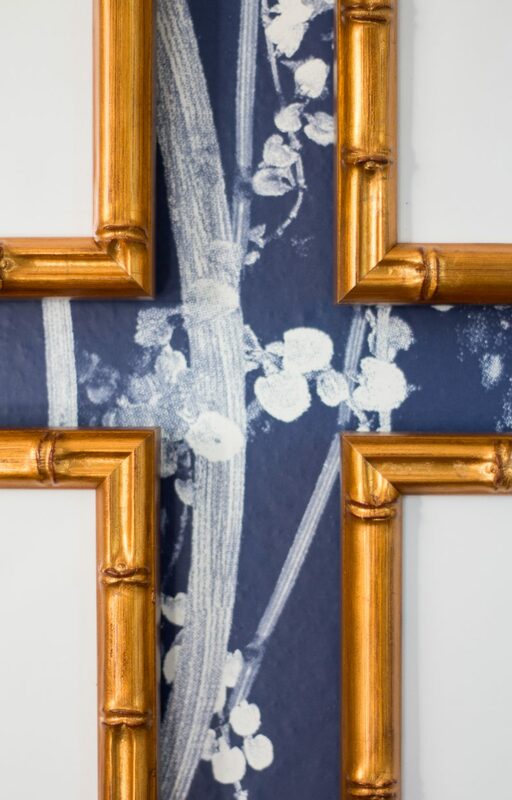 I love the bold wallpaper, and the grid of gold frames is perfect! So, so pretty! Boy, hasn’t temporary wallpaper come a long way? Beautiful choices. I would never, ever get tired of this powder room! Thank you so much, Rachel. I really appreciate that! This is the perfect motivation I need to get my powder room finished! Love it all! One question- Why is the garbage can sporting that brown band?! Seems like it’s calling for a little update as well! Maybe a strip of your wallpaper?! Oh good! I love when a space inspires someone to do their own. The trash can is actually a new find and has beautiful gold detail which the photo doesn’t show well! But cute idea with the wallpaper. Have a great weekend. Hi there! Gosh. That was a HomeGoods find probably ten years ago! I hang on to those pieces I love. LOL! Happy Saturday. Sorry, late to congratulate you. It is stunning. The wallpaper is gorgeous. And, I just adore the bamboo frames but more importantly all the precious family photos. You have infused so much warmth and love into your lovely new home already. Love it! thanks for sharing on craft schooling Sunday! Courtney, it looks beautiful! I love combination of white, blue, and gold! great job! What a beautiful job. The irony is this is my next home project and my powder room has the same configuration. The only difference is I have a standard 8 foot ceiling and the towel rack is located across from the sink and toilet. 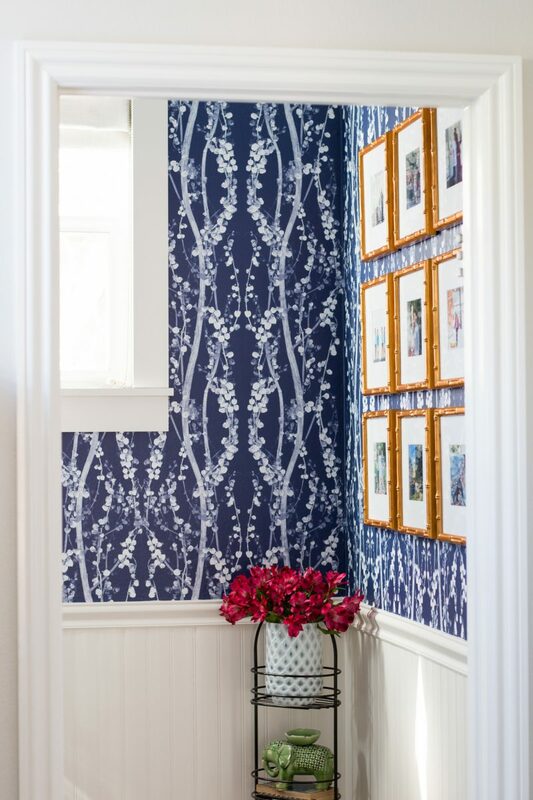 I love your color choice (blue is my favorite and I will be adding an image to my Pinterest board: https://www.pinterest.com/RBR_LLC/color-my-world-blue-decor/) and I too would prefer temporary wallpaper after having removed permanent wallpaper from my powder room. What a gorgeous makeover. 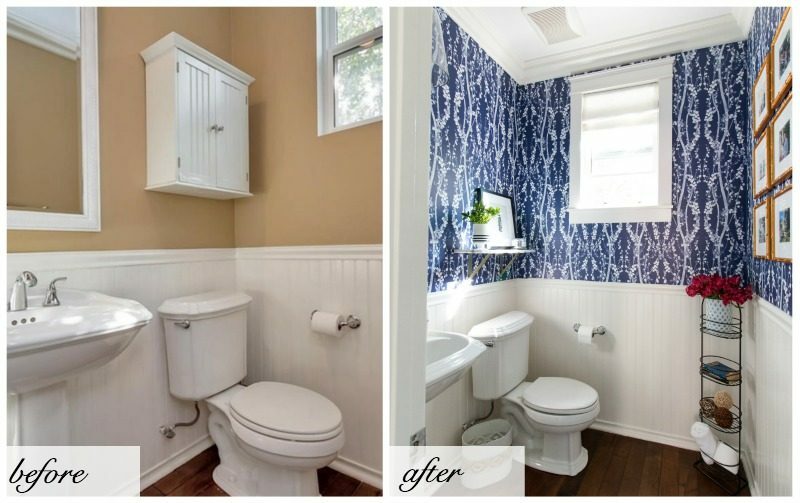 The tan was nice but wow… the blue and white wallpaper makes such a dramatic statement. I love how you anchored it with the white at the bottom. and kept all the rest of the décor very simple. and liner. It feels very balanced. Really beautiful. Oh this is gorgeous. I love the wallpaper, it is stunning. Love it! I’m a big fan of blue & white. This is a beautiful space! I love the gold accents with the blue & white, too. Great job! So pretty! 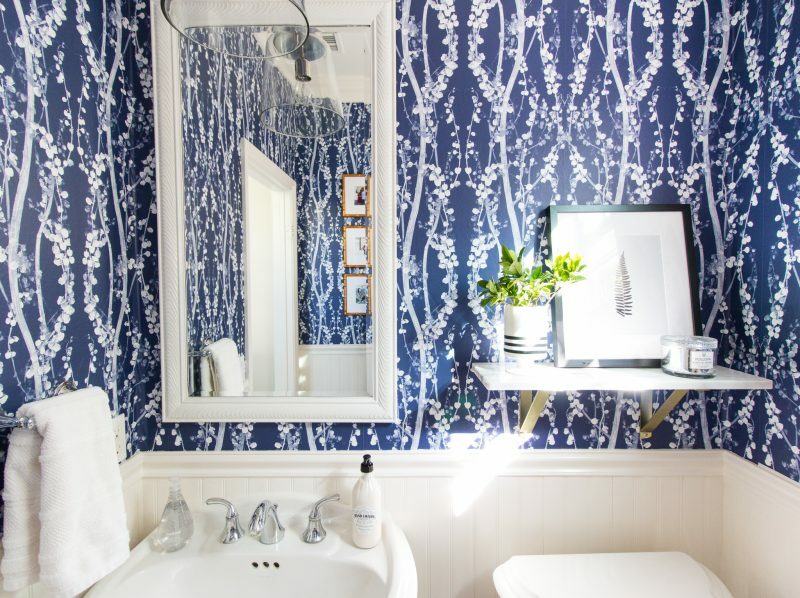 I love that paper and have been eyeing that same pattern for my guest bath. It was nice to see it in an actual room. 🙂 Fantastic Job! I love your blog Courtney! Can I ask what font you use for your posts? What a beautiful bathroom. I love it! Gorgeous! That wallpaper is gorgeous!! Thank you for sharing your beautiful space with us at Merry Monday! Bright and beautiful! Love all the little extra touches! Thanks for sharing at Funtastic Friday! Gorgeous!! I came over from Marty’s feature on A Stroll Thru Life. You did a fabulous job making over this bathroom!! I love everything about this. 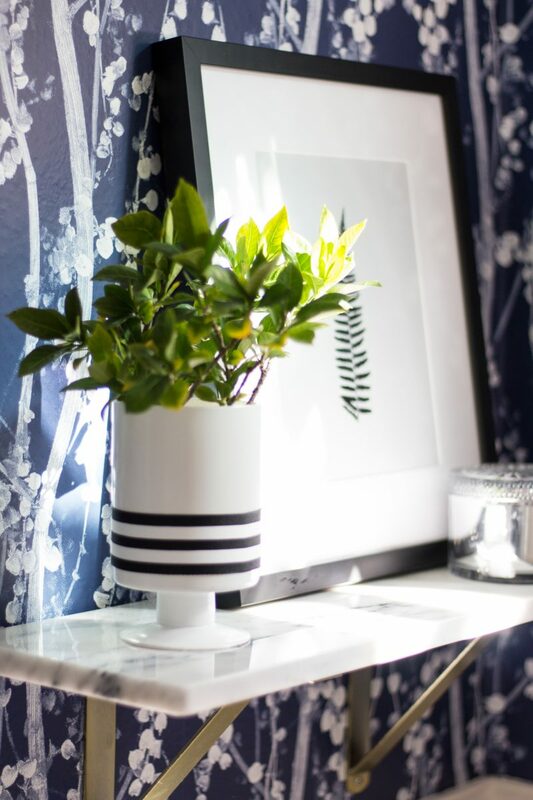 The blue wallpaper, the gold bamboo frames on your gallery wall, the little shelf…lovely space! Would love a tutorial on the removable wallpaper. It was such a chic choice! I love your new house! Gorgeous! I love your bathroom. I just did a small update, but would love to put wainscoting but not sure if you have to remove the sink. If so, my plumber had such a hard time installing my new faucet. Where did you get your toilet paper holder. I’ve been looking for one, and now with your idea for the towel, I’d just by two.